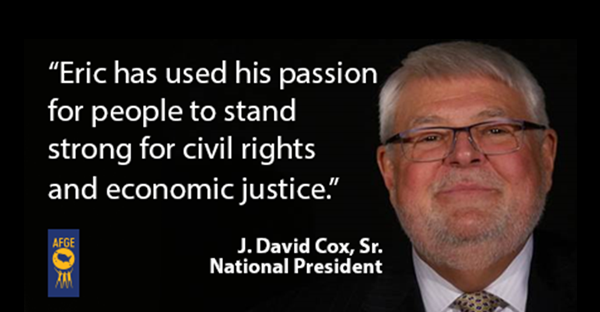 For decades, the labor movement has stood at the forefront of social justice and reform. This week, one of AFGE's own was honored for his trailblazing work in building bridges between the labor, law enforcement, and civil rights communities. The National Action Network (NAN) honored AFGE Council of Prison Locals President Eric Young for his commitment to reforming harsh mandatory minimum sentencing laws and improving officer and inmate safety in the federal prison system. The award holds special significance for Young, the first African American to hold the office of Council of Prison Locals President and also the youngest. Before serving in the Gulf War, and before serving 21 years as a correctional officer and labor activist, Young graduated from an at-risk youth program at his high school outside of Miami, Florida. "I'm a product of a prevention program," Young said. "I attended Mays Junior High School , and was a part of one of those programs that kept me here, for at-risk kids and drop-outs. But here I stand today." Click here to watch Eric Young accept his award at the NAN Martin Luther King, Jr. Day Breakfast. As our prisons grow more overcrowded, the need for meaningful reform to sentencing laws grows more important. In any given federal prison, a correctional worker is expected to supervise more than 120 inmates on their own. They have keys to the cell block and a radio to call for help. Only some staff are equipped with the bare minimum of self-protection equipment, like pepper spray or a stab proof vest. This rampant overcrowding is the result of 30 years of harsh mandatory minimum sentencing laws. Judges are compelled to issue long sentences to first-time non-violent offenders, pushing thousands into our correctional system every year and making our federal prisons a dangerous place for inmates, correctional workers and communities alike. Mandatory minimums are a set of strict sentencing requirements, typically attached to anti-drug enforcement laws that were enacted by the U.S. Congress between 1984 and 1988. The Anti-Drug Abuse Act established the bulk of drug-related mandatory minimums. For various offenses, violators received automatic 5, 10 and in some cases, 20-year sentences. Rather than act as a major deterrent, the law had the effect of putting millions of Americans in federal prisons, causing overcrowding and safety issues for both correctional workers and inmates, all while doing little to curb the nation’s drug problem. 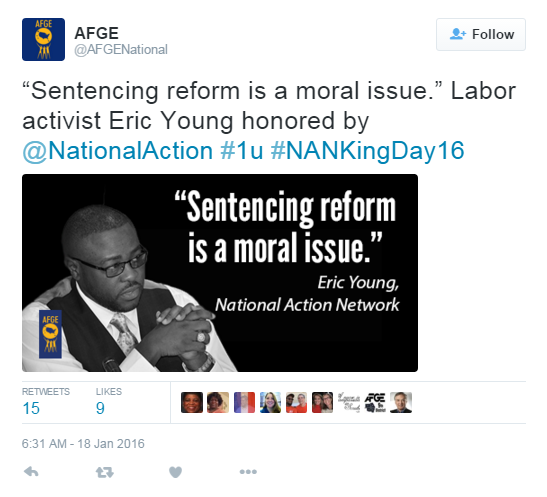 "Sentencing reform is a moral issue," said Eric Young, President of AFGE's Council of Prison Locals (CPL). "America now spends more than $80 billion annually to incarcerate more than two million people in our nation's prisons. The results are crowded and violent prisons, and a booming private prison industry that spends millions of dollars to keep prisons bursting at the seams." 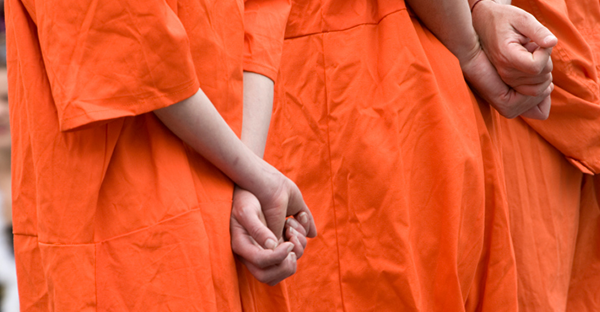 For years, sentencing reform has only been associated with inmate rights advocates. But after years of work on reform, activist groups and the public are taking notice of labor's role in driving change. Young is committed to creating more programs like the one he graduated from, and has helped found similar prevention programs around the country, including the Choices program at his home correctional institution in Miami. "Our children are our future," he said. "Far too many of them are losing their way and being raised in single-parent homes with family members incarcerated. While sentencing reform is a worthy effort, let's try to keep our children out of prison in the first place." Young and AFGE will continue our work on pushing Congress for reform on mandatory minimum sentencing, especially on non-violent first time offenders. Late last year, the Senate Judiciary Committee passed an AFGE-sponsored bill to change some mandatory minimum sentencing laws, allowing judges a "safety valve" measure to reject and change required punishments for low-level offenders. It was the first time in 30 years that the issue was addressed by lawmakers on Capitol Hill. "The first-hand knowledge and advocacy of Eric, along with thousands of Council of Prison Locals members, are a much-needed perspective in the conversation around sentencing reform," said AFGE National President J. David Cox, Sr. "All workers have a stake in expanding civil rights, as workers' rights are civil rights. Eric is a shining example of how integral that relationship is to meaningful reform and a more just society." For Young, changing sentencing laws and advocating for prison reforms are more than just pragmatic solutions to longstanding problems. "When I took office, federal prisons across the country were 36% over their capacities, with high security institutions at an all-time high, at 53% over capacity," he said. "These policies produce broken families, and devastate communities. Because of draconian mandatory minimum sentencing laws, our country incarcerates more people than any other industrialized nation, including high numbers of nonviolent first-time offenders." Young said he hopes the recognition would bring more attention to making prisons, and our nation, more safe and fair for all Americans. "Supporting sentencing reform is a must—it's just the right thing to do," Young said. "Legislators were afraid to support reducing penalties, because they didn't want to appear weak on crime. This prevented meaningful reform for decades." The NAN, founded by Rev. Al Sharpton, has had many notable civil rights icons within its membership. In fact, Coretta Scott King, MLK's widow, and their son have both served on the board. The first chairman of the governing board was Rev. Dr. Wyatt Tee Walker who worked closely with Martin Luther King Jr. as his executive director.